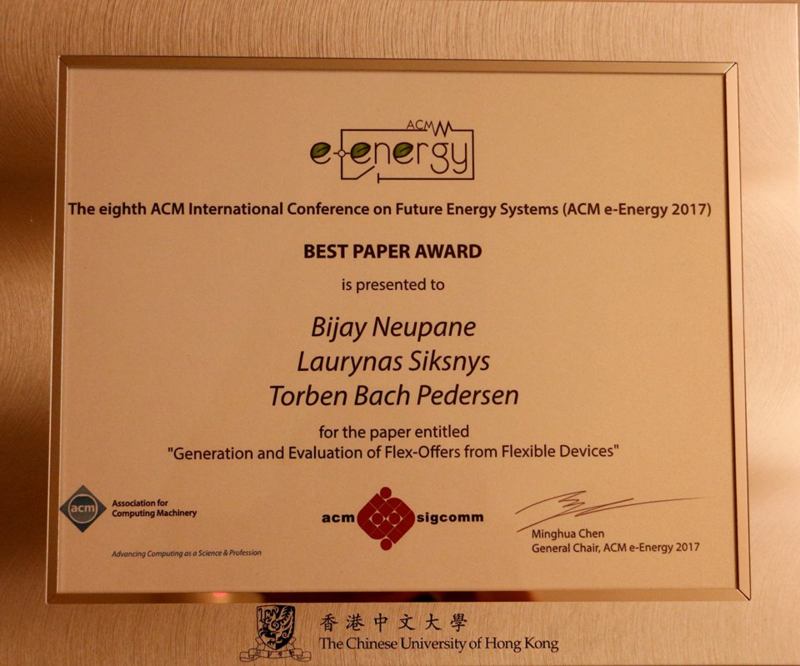 The awarded team of researchers of the Aalborg University in Denmark studied the "Generation and Evaluation of Flex-Offers from Flexible Electrical Devices”. The developed generalized Flex-offer Generation and Evaluation Process (FOGEP) for extracting flexibility from wet-devices (e.g. dishwashers, electric vehicles, and heat pumps) to be offered in an aggregated model, a so-called flex-offer. These flex-offers facilitate the exploitation of demand reduction and shifting of households, enabling the integrating volatile Renewable Energy Sources into power systems. The process, divided into four phases, uses forecasting techniques based on real-world measurement data on past consumption and has been extensively evaluated. Experimental results indicate up to 32% of demand reduction and 15 hours of shifting potential for household devices, offering substantial savings in the balance market.